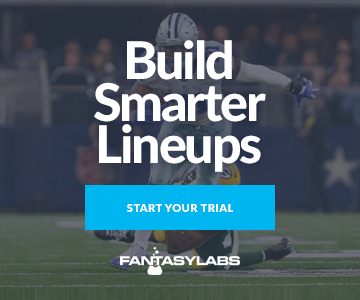 FantasyLabs has an industry-leading Player Props Tool with projections powered by Sean Koerner, the No. 1 in-season FantasyPros ranker for each of the past three seasons. As of writing (Tuesday, Sep. 18), the 2018 NFL player props with a bet quality of 10 are 40-23 (63% win rate). Betting player props is a great way for daily fantasy investors to supplement their regular action. Player props are the bridge between sports betting and fantasy sports. I love them. We have a lot of Tools at FantasyLabs, but my favorite is undoubtedly the Player Props Tool, which sorts through player props available at various online sportsbooks, compares them to our own set of internal projections, rates the quality of each potential bet on a scale of 1-10 and then identifies the book at which the bet can be made most favorably. FantasyLabs co-founder Jonathan Bales has a video introducing the Props Tool. For me, one of the best parts of the NFL season is waking up early on Sunday morning, perusing the Props Tool and hammering as many high-quality bets as I can. Regardless of whether you’re a high-stakes DFS player or a cash-game newbie, you can supplement your action by betting props. If you’re playing fantasy sports, you’re already doing a lot of player-focused research. You might as well leverage that work in as many ways as possible. In no particular order, here are my general thoughts on player props, including why, how and when you should bet them. Put simply: I bet props because they’re profitable. They’re inherently more profitable than spreads and over/unders. Whereas those lines are meticulously set by the bookmakers and rigorously shaped by the betting market, the player props are generally an afterthought. As a result, you usually can’t put more than $100 on any given player prop at one sportsbook, but that’s OK with me, because I don’t bet at a high volume, and I can still spread action across several online shops. Additionally, because my analysis tends to focus more on players than teams and games, I think that relative to the market I have an edge with props that I simply don’t have with spreads and totals. Finally, because props aren’t as important to books as spreads and totals, it takes linesmakers a little longer to adjust the props when news breaks. So on Sunday mornings, I monitor player updates closely on the FantasyLabs News feed, and when actionable information is released, I immediately go to the Props Tool — which is updated in real time with the projections that power the FantasyLabs Models — to see where I should place bets on the players likely to be impacted by the news. Let’s say that the Steelers are at home and facing an AFC North divisional rival. You’ve looked at our Trends tool and seen that quarterback Ben Roethlisberger has historically crushed at Heinz Field. You think that the Steelers are likely to cover the spread, and you also think the game is likely to hit the over — but you feel much more confident that, regardless of whether the Steelers cover or the over hits, Big Ben is going to have a massive game. Great. Bet the over on Roethlisberger’s yardage and touchdown props and leave the spread and over/under alone. Put your action on the bets where you have the most confidence. Imagine that you do a lot of research on a player. Almost no one in the industry is talking about him, but you think he could have a massive game. He’s relatively cheap on DraftKings and FanDuel, so you’re easily able to fit him into your DFS lineups. And then the slate kicks off, and your guy has a career-best day. Congratulations. You rock. There’s just one problem. A couple of your core players suffered random injuries early in the day, so your lineups tanked. You were right about the breakout player, you were able to get him in your lineups — but you don’t actually get any benefit from rostering him. That’s annoying. And that can be mitigated by betting on his individual player props. By diversifying your action and wagering on players outside of DFS, you can ensure that you still benefit from your player research even if a guy goes off but is rostered in non-performing lineups. Essentially, player props allow you to limit your overall player-specific risk through non-correlated investments. If one of your players gets injured, he won’t ruin your entire portfolio of player investments if you have exposure via the props market. Almost every slate, there are players that you want to roster but just can’t fit into your lineups. Maybe they are too expensive. There’s a whole host of DFS reasons why in any given slate it can make sense not to roster players you otherwise like. Instead of trying to cram these players into lineups you know will be suboptimal, simply pivot to the props market, where you don’t have to worry about DFS salaries, ownership rates, correlations, etc. If you like a guy’s fantasy potential but think he’s not a good fit for your lineups, that’s fine. You can still invest in him profitably via his player props. Roster “value” (scrub) players you dislike just so you can squeeze more top-end players you like into your core. 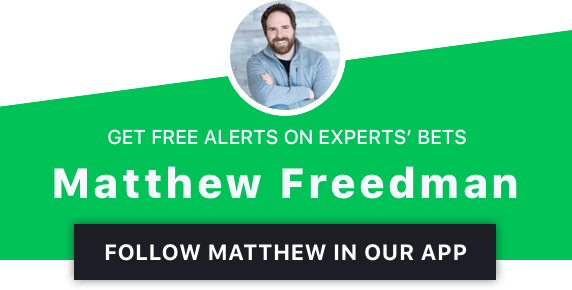 The props market is the most natural of means to supplement your DFS investments. If you play DFS, there’s a lot of uncertainty you face. Are you putting your lineups in the right contests? Will your head-to-heads be scooped by sharp professional players looking for easy money? Which DFS players are in which double-ups and guaranteed prize pools? What will the ownership rates be for various players across different buy-in levels? Which DFS stacks will be overly chalky? How many points will your lineups need to score in order to cash? With DFS, there are so many questions you need to try to answer. Player props are simpler. They have just one question: Will this player outperform (or underperform) this line? The props market allows you to simplify your analytic process and focus on just the on-field performance of the player under consideration. DFS is a great game. It’s also complex. Next to DFS, it’s also nice to have the straightforwardness the prop market affords. Sometimes, it just doesn’t work out for you to create lineups for a DFS slate. Maybe you’re too busy with work or other responsibilities and don’t have the time to build lineups you feel confident in. Or perhaps you’ve traveled to a state where some DFS platforms don’t offer contests. Any number of scenarios can suffice. In such cases, it’s often easy to make low-maintenance investments in players you like via the props market. At FantasyLabs, we have ceiling and floor projections in our Models. Our Director of Predictive Analytics Sean Koerner manages our projections, so we’re confident in the numbers we produce — but it’s always worthwhile to consult the player props to get a sense of what the professional bookmakers think of a player’s potential. Of course, Vegas lines shouldn’t be used as if they’re projections because many market forces shape the lines, but we can still gain an edge by taking the player props into account as ancillary data. If a player with a low ownership projection has player props that are relatively high, he could make for a high-upside differentiating play in GPPs. There might be only a few situations in which it actually makes sense to hedge a DFS lineup with a player prop, but the option is always available. Let’s say that you’re in a mid-to-high-stakes main-slate head-to-head contest. As the 1 p.m. ET games are finishing up, you have a sizable lead. On top of that, you have just one player in the 4 p.m. ET games, as does your opponent. Because of how his roster is constructed, you can accurately surmise the identity of the one player left in the opposing lineup. If you wanted to, you could hedge by betting the over on that player’s props — especially if you think the player has a good chance of hitting the over and if you anticipate that the opposing lineup has almost no chance of beating your lineup if the player fails to hit the over. You could further hedge by betting the under on the player in your own lineup — although doing so in the long run might not be profitable: Why would you bet against a player whom you thought highly enough of to put in your lineup just a few hours earlier? There are pros and cons to hedging, and I doubt that few people actually do it well. But if you want to do it, the props market provides the opportunity. Yeah, baby! THIS is the best part of the props market — and it’s not even close. A big part of your job as a DFS player is to eliminate players from consideration. To be successful at DFS you must (make a deal with the devil and) figure out who to fade. Here’s the problem: It’s not fun to fade players! There’s no obvious upside to it. There’s no clear profitability in it. In DFS, when you see a player with unrealistically high expectations, all you can do is avoid him — but you can’t otherwise benefit from your knowledge. You can’t sell him short. You can’t directly win money just by not rostering him when you’ve correctly projected that he will underperform. But with player props, you can actively invest against your fantasy fades. What’s more, just as game totals tend to be inflated and spreads tend to be skewed toward popular teams, player props are inherently shaded to the over. As a result, it’s usually sharp to lean to the under on props, which means that when it comes to betting against your fantasy fades there’s often no shortage of value to be found in the Props Tool. On Sunday afternoon, when you see a high-owned fantasy fade of yours punish his DFS investors with a subpar performance — and then when you see that he won money for you by going under his player props — that’s one of the best feelings in the world. To some DFS players, fantasy sports are entirely different than sports betting. Regardless of where you stand, you can surely see the utility and value of the props market. It allows you to increase the number of players you invest in (and against! ), and it naturally facilitates diversification. Additionally, the research you do as a DFS player directly prepares you for the market and furthers your ability to leverage the knowledge you have. And most importantly, it’s fun. Every Sunday, it’s fun to root for (and against!!!) a wide array of players without having to think about how their performance impacts all of the various DFS and season-long lineups you have. Sometimes, it’s fun to have a streamlined and fantasy-agnostic stake in how players do.